An interesting and enjoyable day today, albeit quite frustrating. It started off great when I stood on the back doorstep drinking my cup of tea, enjoying the early morning sunshine. Quick as a flash, a superb Hobby came hurtling towards me from between the trees in the neighbours garden. It skipped over the shed roof and flashed its streaked underparts at me from just 20 yards away, and carried on down the driveway and across the road. Such close views, I think it was chasing the local House Martins. I've seen a few Hobbies soaring over the garden, but not whizzing through it like this. Then at quarter to nine, the grapevine text arrived : "singing Greenish Warbler at Pleinmont". Finally, a second rarity this spring, after the Red-rumped Swallow. Unusually, I was just able to get dressed and run out the door straight away for this one, and I was on site about 30 minutes later. 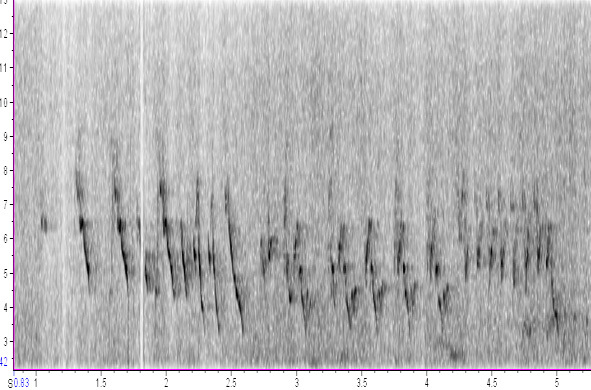 Mark Guppy was there, who found the bird and he explained it was moving around quite a bit, feeding in a circuit, and every now and again stopping to sing. It was mostly in the Sycamores by the roadside above Pezeries Bay. Julian and Liz arrived and we looked around the area for a while until someone found it singing quite close to the road. We were very close to the bird but we just couldn't see it as it sang away in the back of a small Sycamore. Full credit to Mark for picking out the song on this bird - I would have most probably walked straight past it. It was different when you really listened to it, but it's not exactly a distinctive, unmissable song. 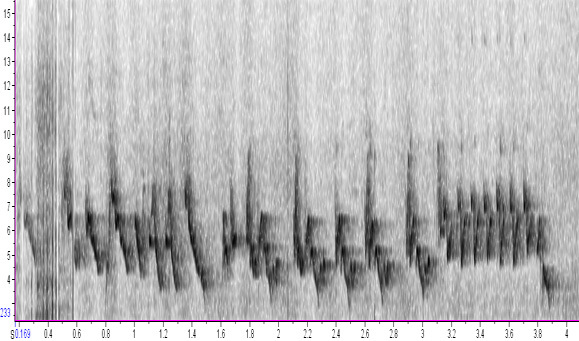 It starts off as a Chaffinchy-warble, ending in a short Wren-like trill. Whilst we were waiting for it to show I managed to get a couple of recordings on the Remembird, but it was so windy, it was difficult to get a clean sound. 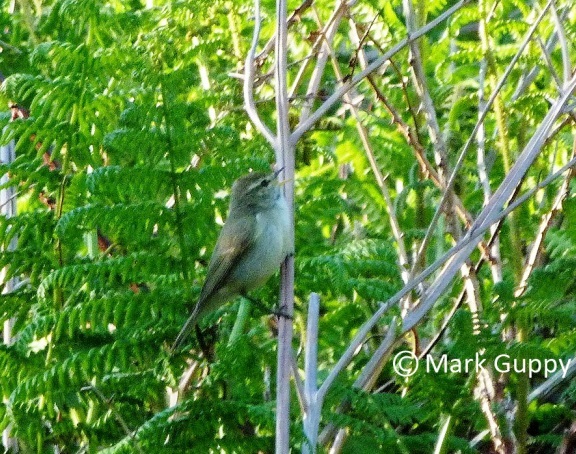 song of Greenish Warbler - Pezeries, Pleinmont, 26 May 2012 - the best I could manage on such a windy day. As I left the site at 10:45-ish, to get back for family stuff, the grapevine message came through for Black Kite over the Greenish Warbler site. As I was by Rocquaine, I 'scoped back towards Pleinmont and could see 3 Buzzards and a Marsh Harrier circling over the headland but no kite. So, I just missed the bird by a few minutes. I have not been able to do very much computer-wise recently, as the techno-bods at the Education Dept have been trying to "fix" my laptop which went haywire about a month ago. When I say "fix" what I mean is "not fix, because it never needed fixing in the first place". Their solution when a school computer goes funny is to just wipe everything off it - which is a pain for me as I have to copy all files externally, then put them back on again afterwards, re-install various programs etc. So when this didn't work and it was still going weird (only in school though, not at home) they were going to send it off for a total re-fit. However,whilst waiting for this to happen, they left it on overnight in a different part of the school, and it miraculously mended itself! I was going to suggest that they advertise the cookery storeroom as some kind of "Lourdes for Laptops" but it seems that when sitting in my classroom, the computer was constantly trying to upload an update, and was never quite doing it and so slowing it down. So the solution that took nearly a month to work out was - "Move it 30 yards". Classic. Also in the last week or so, events have conspired against me to limit my birding: Rosie's shifts have been unhelpful, the rain has been terrible at times, and I have had my third bad cold this year already. But it doesn't seem that many other people are having much better luck as the rarity count this May has been awful so far - just a few very brief Bee-eaters and Orioles. Lunchtime of the 12th wasn't bad with Spotted Flycatcher and good views of 2 Garden Warblers at Fort Saumarez, and on 16th, I found a Black-tailed Godwit at the Vale Pond. But that's been the best of it I'm afraid, so here is a singing Goldfinch to brighten the mood. Of course, even without the birds there is still plenty to see, and the find below is potentially the most interesting. 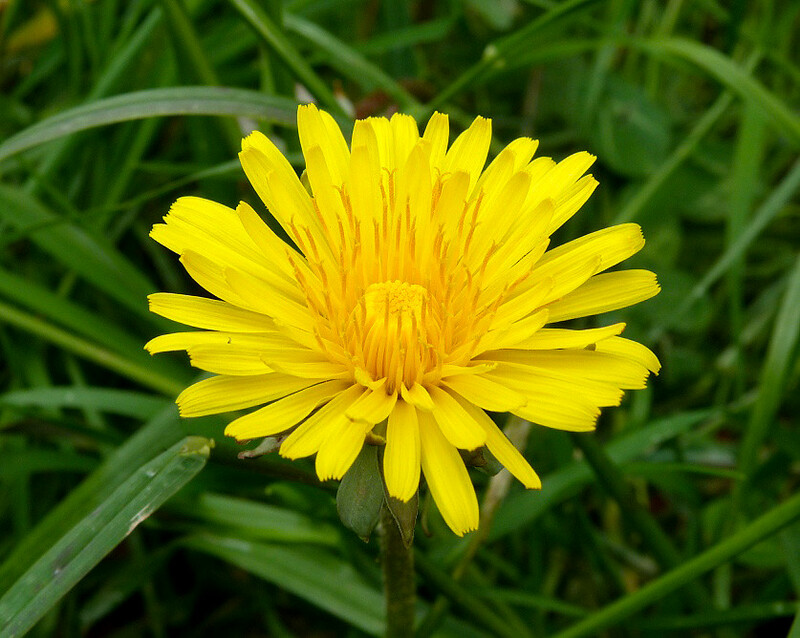 I was out briefly on L'Ancresse Common and I collected a few plants to ID back at home. On one of the Field Wood-rush seed heads I noticed a Coleophora case. The main species that feeds on this plant is Coleophora otidipennella, and the case is a pretty good match for it. If true, this would be a new species for Guernsey. 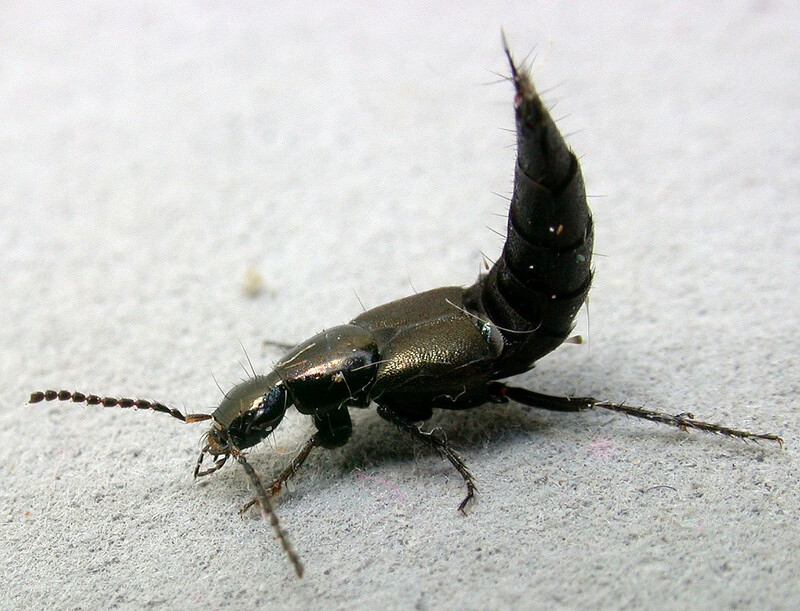 probably Silpha tristis - garden, May 2012 - a largish, snail-eating beetle - yuk. 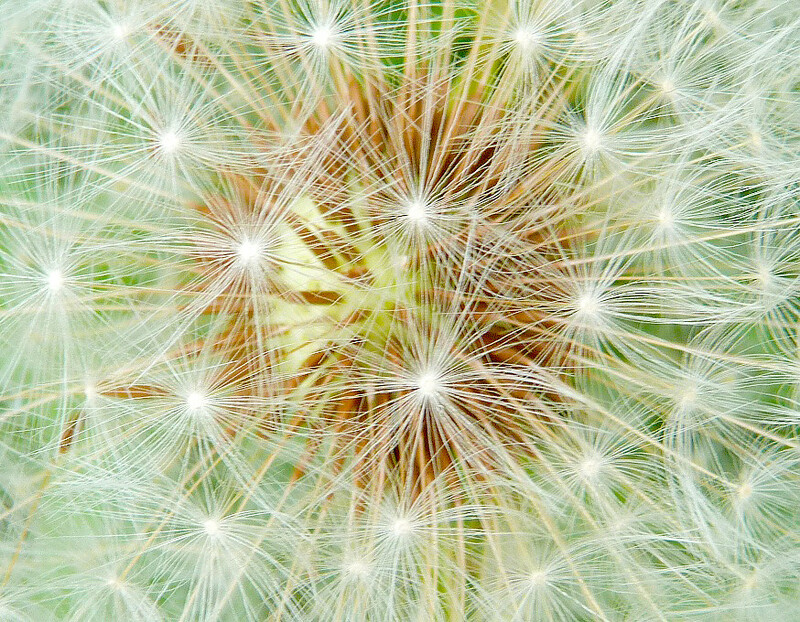 Dandelion - garden, May 2012 - despite its ubiquity, this family of plants has to be one of my favourites, the golden colour is just so intense and then they suddenly turn into the amazing scrum of fairies like below. This weekend has also been the last weekend of the football season. And from my point of view it has been really, really fabulous. I have enjoyed this season more than any other season for years (of course, this is pretending I do not have a specific team I support.....). To summarise, here are my top ten good stuff and top ten bad stuff of season 2011-2012. 1. - Man City win the League - I am 39 years old and I can only remember six different winners of the Football League - just six in all those years! So, although I am not especially a Man City fan, I was really pleased that a different team has finally won. Fair enough there is the criticism that they have 'bought' the title, but I am more thinking of the fans of the club. I'm sure it matters not to them. 2. - The final day - The incredible ending to the season was totally amazing. I watched it all on Sky Sports Saturday and I thought Paul Merson's head was going to explode! That final City-QPR match was just perfect and what football is all about - a glorious mix of skill, excitement, drama and pure violence - brilliant. The best final day ever - without a doubt. 3. - European Cup - Echoing a lot of what I said about Man City, it's good to see a new name on a cup, and I really enjoyed Chelsea's incredulous European Cup win (I do not recognise the term "Champions League"). How they managed to avoid defeat in the semis and in the final was totally ridiculous, but made both games totally exciting. I don't like Chelsea much but I do always support the British teams in Europe. 4. - Watching more matches live - One of the main reasons for enjoying this season more than others recently is that I've seen more football, because even if the rest of the family are hogging the TV, I can now watch many games live on the internet. Score! 5. - Guernsey FC - This season was Guernsey Football Club's first ever in the English league system and they totally bossed it, winning the league and cup double in the Combined Counties Division One. I bet there has not been many 9th-tier matches with a 1000+ crowd before. 6. - Goals! Goals! Goals! - It may be just that defenders are getting poorer, but I think it is because we are getting better attacking players coming into English football, but this year has had the biggest goals-per-game ratio since the 1960's. 7. - Gary Neville - He's been a great pundit on Sky and makes me laugh with the way he tells it like it is. And the strange noise he made as Torres scored against Barca was a classic. 8. - Lionel Messi - despite the skills and obvious quality of Barcelona, their arrogance, lack of humility and gamesmanship means I have never really been on their side. Except for Messi of course who shines above them all. 72 goals in one season speaks for itself. 9. - Roy Hodgson - So pleased that the FA didn't bow down to the brainless hacks and appoint that idiot Redknapp as England Manager. Fair enough, Hodgson may not do especially well since our players are pretty average, but I think it was a good decision. 1. 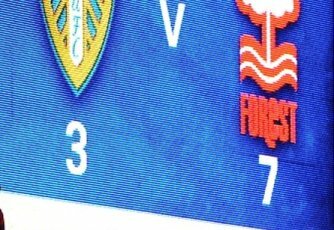 - Leeds United - Don't need to say much about the season just gone, which peaked in awfulness in the picture above. We started off pretty rubbish and lucked our way into the play-off places. Then we sacked the manager and our luck ran out and we dropped way down. The only reason we weren't relegated was because there were quite a few teams even worse than us. We were definitely a better team when we were in League 1 - since then we have sold off our better players and brought in a rabble of bored loan players, simple thugs, old pensioners and can't-be-arsed Cowboys. At least Colin has recognised this and seems intent on sacking half the players and getting in as many others as he can. However, so long as Bates keeps his stingy wage-policy, we cannot attract anyone decent. It is poor poor poor, and will not get better for a while yet. 2. - Deaths and other sad stuff - there seems to have been quite a bit of this this season, with Muamba, Petrov, Morosini. But of course the most horrible being Gary Speed, one of my heroes when I was a teenager down at Elland Road. So so sad. 3. - John Terry - One man that represents eveything that is wrong in the world. The obnoxiousness of the guy is incredible. I wish he had been sacked from playing for England, whether we needed him or not. 4. - Liverpool FC. - I have always pretty much liked Liverpool, but the way they have handled themselves this season has been atrocious. Backing Suarez when he was clearly in the wrong, especially with those T-shirts, and also Dalglish mumbling and being argumentative in interviews. Very poor formfromsuch a famous club. 5. - Finances - despite the FIFA financial fair play initiatives supposedly coming in soon which may improve the situation, how on Earth can a team 400 million pounds in the red be challenging for the title, with other smaller teams going out of business for want of a few quid. 6. - Alan Shearer - Listening to him on Match of the Day sucking all joy and brain cells from the room is just embarrassing. He is so poor its incredulous. 7. - Sepp Blatter - 'nuff said. 8. - Ref abuse - Why don't refs ever book players for clearly swearing at them in matches? Rooney et al are always F'ing and blinding straight at the refs and nothing ever happens. The schoolkids do notice this. 9. - FA Cup Final - Should be last game of season. Should be at 3pm on a Saturday. Should be no other matches that day. Should not be semis at Wembley. Some things should never change. 10. - Retirement - Veteran player Lawlor hangs up his boots. Fans inconsolable. With the massive influx of birds which arrived over last weekend, this week has been really busy with migrants. 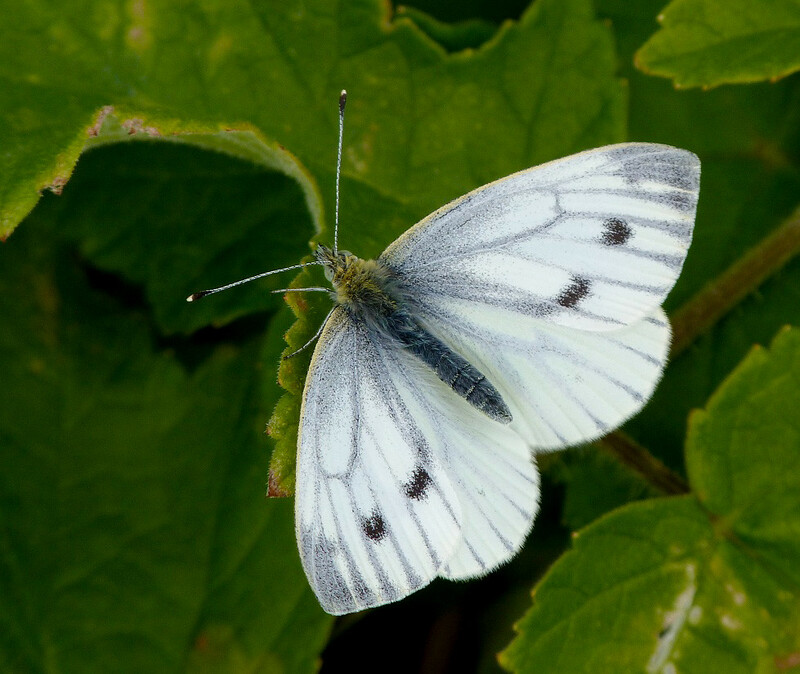 Often, when May arrives, numbers quickly tail off, as most common migrants are already pairing up in the UK. But due to the blocking weather, there were lots of late Willow Warblers, Sedge Warblers, Blackcaps and White Wagtails everywhere I went. 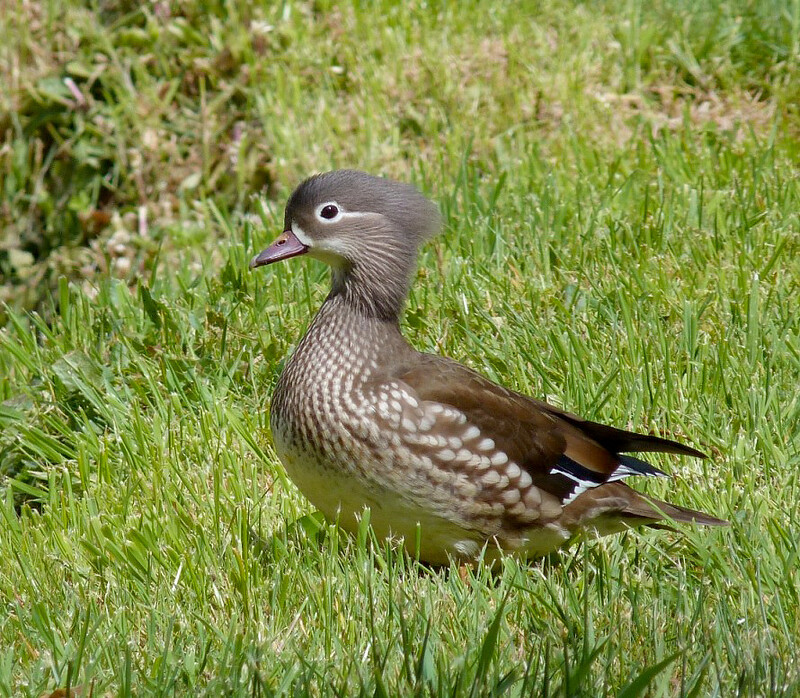 The first thing I wanted to do was take a proper look at the Mandarin that we found on the Bird Race at the Grande Mare. It was still present at Monday lunchtime and posed well for the cameras - a beautiful-looking duck. Mandarin is not on the Guernsey list because we think that it is likely that the few records we do have of the species are from collections in France or perhaps Jersey, where they seem to have a handful of free-flying birds. 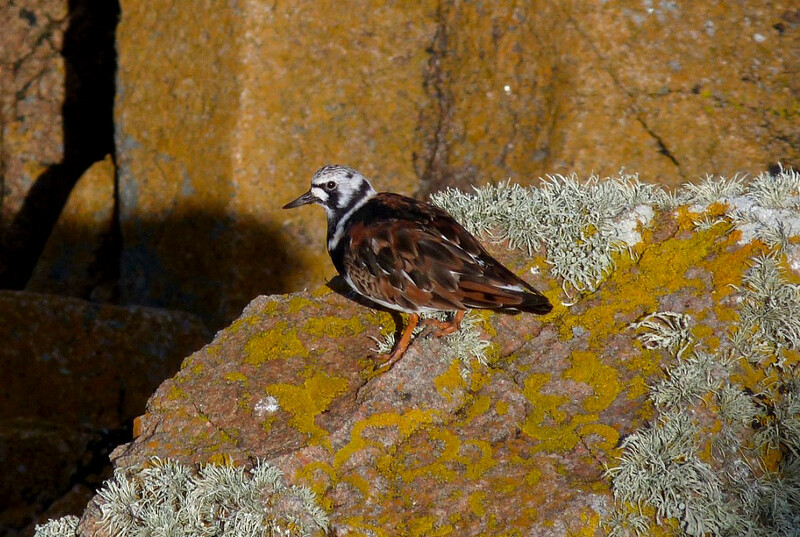 But we don't have any here in Guernsey as far as we know, so this bird has at least flown across the sea to get here. (As you can tell from the photo below, it wasn't very wary of me). Thursday was another good day for migrants, with another large arrival. This time however, rather than warblers, it was mainly Wheatears. In my lunch hour walk around Fort le Crocq, I estimated at least 100 Wheatears on the beaches either side of the headland - there were birds dotted along every few yards. There were also about 50 White Wagtails with them, and two male Redstarts were feeding in a roadside garden. Rather a superb half an hour. And that evening, just as it was getting dusky, I noticed a Whitethroat feeding in the rough plot across the road from us - a house tick! But the last few days things have quietened down somewhat, and I was out for a couple of hours earlier today without seeing a proper on-the-deck migrant. So there has been a decent clear out in the better weather at the end of the week. More rain is forecast however, so I am sure that migration is not over yet. 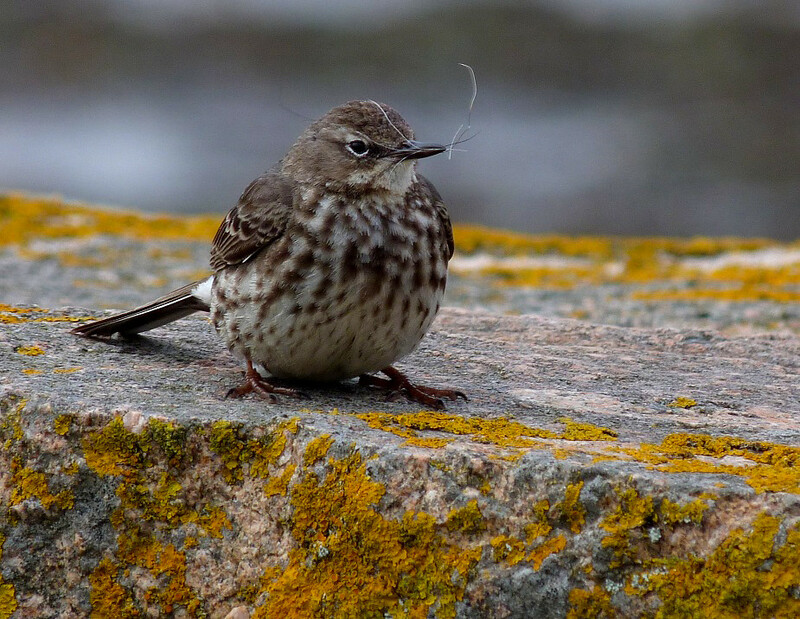 Rock Pipit - Fort Hommet, April 2012 - This bird appears to be nesting nearby and is collecting material for that nest - dog hair it looks like! It is just my personal impression, but I think that breeding-plumaged Rock Pipits get whiter below and greyer (less brown) above the further south you go in the country. The northern birds I used to see seemed always to be browner than the birds which nest here on the island. Lousewort - L'Ancresse, 6 May 2012 - A very restricted distribution on the island, only growing in a few places, but where it does, it is rather plentiful. Wood Forget-me-not - L'Ancresse, 6 May 2012 - The wild Wood Forget-me-not is apparently the same species as the garden variety, and so this is probably a garden 'escape'. 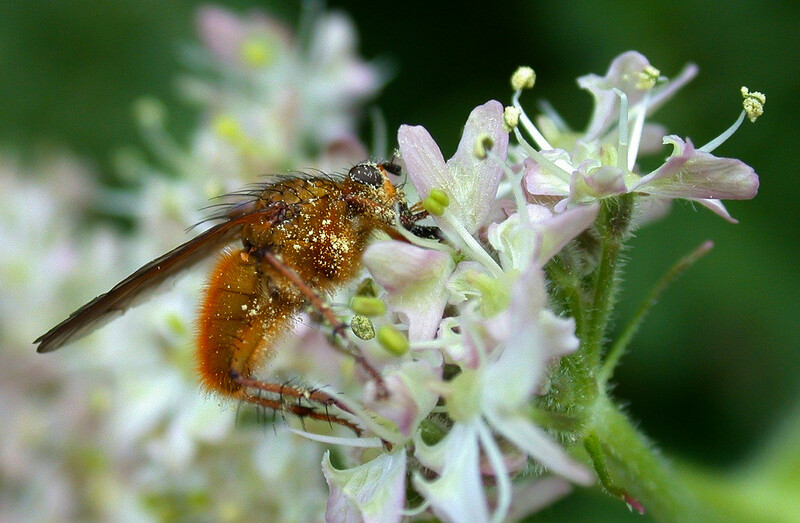 Yellow Dung Fly - Chouet, 6 May 2012 - successfully carrying out its duties, pollinating a Hogweed. And that was the day. Even though we had our lowest proper total ever (first one in 200 was just a practise), we finished in very good spirits. We had such low expectations of the day due to the weather, that it was difficult to feel surprised by the poor showing. And the total was irrelevant compared to one of the best morning's birding I've ever had in Guernsey. I cannot remember such a heavy Spring fall of migrants, with warblers everywhere we looked. It was truly a spectacle. As always we learnt a few tips and tricks for future races (which will of course remain secret) and we felt that doing a week earlier than usual was a benefit. I think it is something to consider in future, doing it in the last weekend in April rather than the first in May. Also, I think we enjoyed it more knowing that we were not in direct competition with anyone else, just with ourselves.